I am so excited about today’s episode. Why? Because I love questions. I love asking them, being asked them, evaluating them, and looking for new ones. Innovative approaches are all about asking questions. As a “what if” personality type, questions are my jam. I also have an awesome freebie to go along with this. I talk about my ENTP personality type. My favorite book A More Beautiful Question, and how actionable questions can be used in business. 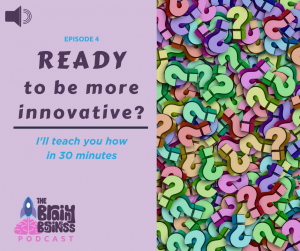 I talk about the right approach to questioning and going from “why” to “what if” to “how.” I talk about question storming and how this can help you find innovative questions that lead to innovative answers in your business. Questions are a great tool to think outside the box and come up with business changing answers. [01:48] I am an ENTP which means I’m extroverted, intuitive, thinking, and perceiving. Stats say that between 1% and 3% of the female population is this personality type. [02:33] My strength is understanding the world around me almost immediately, absorbing ideas, and turning possibilities into ideas. [03:09] I also have a love of finding the right answer, and I’ve always been a straight-A student. [03:26] When it comes to brain training what is better? Questions or answers? and Why? [03:33] A More Beautiful Question by Warren Berger is my favorite book. [04:54] A beautiful question is an ambitious yet actionable question that shifts the way we think about something. [06:09] Innovations that came out of beautiful questions include Airbnb, the Cheetah prosthetic leg, Kodak film, Wite-Out, and microwaves. [06:15] The right approach to questioning is to go from Why? to What if? to How? [06:33] Why questions are your big overarching questions. This is where you start from. This is passion and the core of what you do. [07:20] Why do we have to wait for the picture? Is a question that was asked by the daughter of Kodak’s founder. [08:09] People who asked these questions change the world. And you can to with a little bit of brain training. [08:20] Our brains are built on habits and rules of thumb which the subconscious uses to make decisions. [08:53] The more habits you let your subconscious brain get used to, the less reason it has to stop and give your conscious brain something to work on – allowing it to be more and more complacent. [10:07] These questions refer to places where your subconscious brain has taken over the process. [10:19] Train your questioning muscle with these simple tasks of putting your makeup on with your nondominant hand or taking a different route to work. Change things up and force your brain to pay attention. [11:26] How our brains store and retrieve information. [11:39] The Political Mind: A Cognitive Scientist’s Guide to Your Brain and Its Politics and the blue square example. [14:19] What does this have to do with business? [14:57] Brainstorming is taking ideas off the surface but not really digging in. [15:14] To help clients approach problems and think about things from different angles, I recommend the activities from Thinkertoys: A Handbook of Creative-Thinking Techniques. [15:39] Questionstorming is an easy thing to try. The goal is to ask as many questions as possible. [16:37] An example of questionstorming. [18:28] Asking “what if” questions and taking the problem on as your own to shift your thinking. [18:37] Pandora asked “what if” we could map the DNA of music? [18:44] The brainy business “why” question is: Why is behavioral economics a best-kept secret? [18:49] What if I show people why it matters? What if I tell people how it works? [20:31] Becoming a better questioner and linking distant connections. [20:52] The final piece is the “how” question. Keep asking “how” until you get to the final piece that sticks. The trick is to fail and fail often. [22:00] Solving problems means knowing what questions to ask. [23:33] Don’t let your fear of finding the perfect question keep you from getting to the right answer. [23:50] It takes many questions to find the path to an answer. Start asking as many questions as you can. [25:14] Helping organizations to ask better questions and look at things in a new way is probably my favorite thing to do. Send an email to Melina@TheBrainyBusiness.com and reference episode 4 Questions and Answers to be one of the first three people to get a free strategy session.